If you have a good relationship with your roommate, chances are that you two may end up sharing some things. And just from living in such close proximity to one another, it’s nearly inevitable that you both would share some things, sometimes without even realizing it. But if you want to be a little more intentional about exactly what kinds of things you two should share, it may be a good idea to draw some boundaries and come up with a list of items that each of you would feel comfortable sharing with the other. Read on for some ideas on what to consider sharing with your roommate. A few things you and your roommate can certainly share are cleaning supplies, which may include a small vacuum, disinfectant wipes, or a broom. A vacuum is definitely convenient to have in your room -- most likely you won’t need to use it at the same time as one another, and it will take up less space than having two vacuums in the same room. A broom and dustpan are also good things to share, particularly if there are any hardwood floors where you’re living (perhaps the kitchen or common room area), so you can easily sweep up messes. What’s more, disinfectant wipes -- or items like paper towels and cleaning fluid -- are easy to share as well. Simply buy in bulk and keep them somewhere in your room so that you and your roommate can easily access them. Even if you and your roommate are both on the campus dining meal plan, you’re sure to want some extra snacks and drinks in your room just in case. 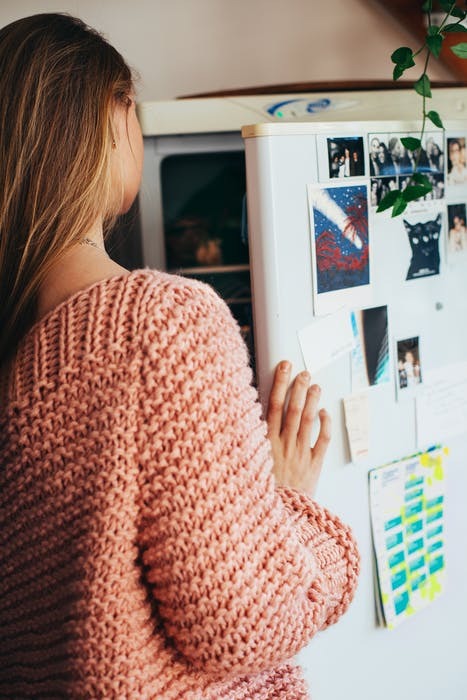 That’s where a mini fridge really comes in handy -- but instead of having two different fridges taking up a lot of space, you can have one fridge that will be big enough to hold food for the two of you. If you’re afraid of not being able to tell whose food is whose, create some boundaries. Perhaps the top shelf could be assigned to you and the bottom shelf for your roommate; create a system that works for the both of you! Maybe everybody these days just uses Netflix instead of watching on an actual television set, but sometimes a TV can be useful. If either you or your roommate has guests over and wants to watch a movie or show on a larger screen, or even if one of you just feels like flipping through good old cable channels, a TV comes in handy. And in most cases, there’s no need to clutter up your common living space with multiple TVs, so sharing one is certainly an efficient option. Decorations are another great thing to share between you and your roommate. If you have decorations such as string lights, posters, or anything of that sort that occupies wall space, it might be a good idea to share some of those items and coordinate who gets to use which parts of the walls. Particularly if one or both of you wants to hang up string lights, it may be beneficial to have just one of you bring them, as the string of lights will probably be long enough to go around the perimeter of the whole room. If you live in a dorm with a kitchen or perhaps an on- or off-campus apartment, you and your roommate will both need cooking supplies. Instead of each of you spending a fortune on your own cooking equipment, why not coordinate what each of you can bring or go shopping for supplies together? Doing so will not only allow you to save on costs, but also on the amount of space your stuff will take up in the kitchen. Sharing larger items, such as rice cookers, big pots and pans, toasters, and coffee makers, is pretty doable as long as you are both respectful of each other’s belongings. Even sharing smaller items such as utensils as well as plates, bowls, and cups is manageable if you are able to identify whose stuff is whose at the end of the year. Beyond the belongings in your room, something else you and your roommate might want to share is textbooks. If you happen to be taking some of the same classes, this is a great way to save money, especially because textbooks are often fairly expensive. As a result, sharing one (or several) and splitting the cost could potentially do wonders for your bank account. Whether the textbook is a physical or electronic copy, you and your roommate can work out a system as to who can use it when. If both of you are up to it, you can even become study buddies for a class and use the textbook at the same time. When it comes to sharing things with your roommate, don’t sweat it. As long as the two of you are respectful of each other and can work out a system, you’re both good to go!